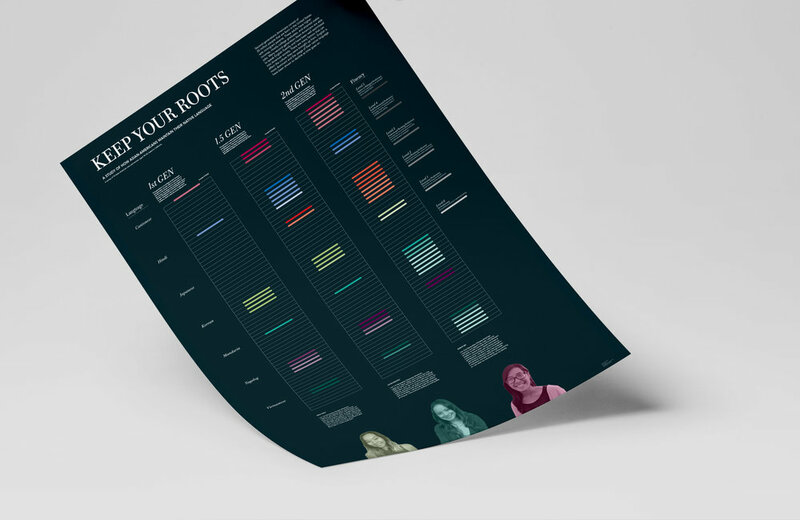 Keep Your Roots is an infographic that tracks how native language is loss in each generation. From surveying 70 Asian-Americans, aged 18–30 in California, the majority of their loss was due to the lack of practice and self-rejection of the language. The infographic sheds light on how language fluency is decreasing among each generation and which factors can cause this change. Being an American Born Chinese, I felt a burden lifted during my research and that many others were in my similar situation. Cantonese is my native language but I am not as well versed as I could be. Through this, I found a new appreciation for the language and want to continue developing my conversational skills in the best way I can.